Segment is a group of subscribers of a list filtered by a certain logical condition. For example, subscribers who live in Frankfurt or who subscribed after 01.01.2012. You can create as many segments as you want. To create a segment click on a list in the left menu. Then click the "Segments" tab. On the following screen you can setup your segment. First give a name to the segment. For example: "From Frankfurt" or "Since 2012". Then type the description of the segment. It's not mandatory, but if you define a difficult segment condition it's recommended to write a short description. This description will appear on the screen where segments are listed, for example, in the first step of the delivery schedule setup wizard. After that, define the segment conditions. You can create logical expressions by which the subscribers will be filtered. Apply the principles of the boolean algebra. For example if you want to list subscribers who are from Frankfurt select the city from the field dropdown, set the relation to equal and type into the value field: Frankfurt. If you want to list subscribers who are from Frankfurt and subscribed in 2012 then add a new condition to the segment by clicking the "Add condition" button, select the Subscription date from the field dropdown and "after or precisely on" from the relation dropdown and set value to 01.01.2011. After that set the logical relation to AND between the two expressions. If you want to delete a logical expression click the icon next to the expression. You can check how many subscribers will be in the segment at the bottom of the page by clicking the "Re-calculate" button. When you click on the button it calculates the number and a "list subscribers" link appears. Click on it to list the filtered subscribers according to the conditions defined above. If the field type is checkbox then there are only two possible values: checked or unchecked. If the field type is a dropdown list and radio you can set a value from the option's dropdown list. There are further filter options available below the conditions. You can filter by the status of the subscribers. By default the segment will list the active subscribers only. This is because in a campaign you can send emails to active subscribers. 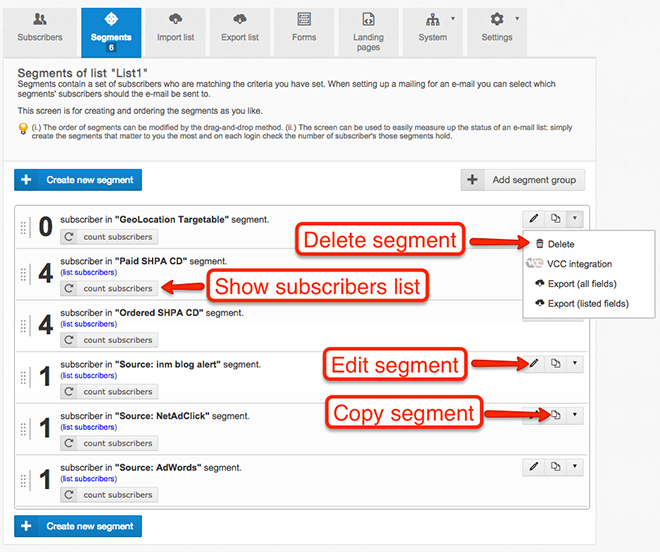 But, if you want to create a segment to analyze the data of all subscribers, choose the "all" option. 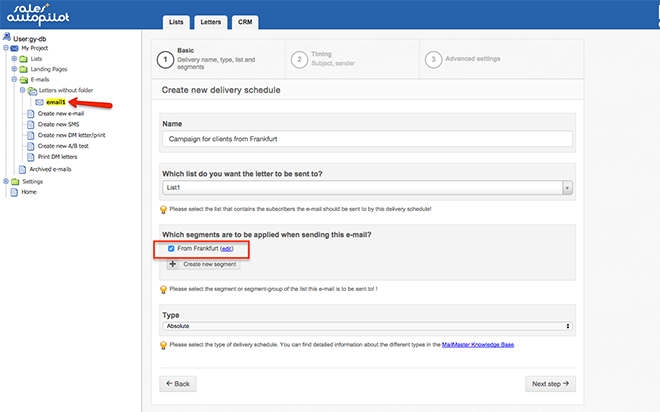 You can also set whether to count recurring e-mail addresses as one or not. 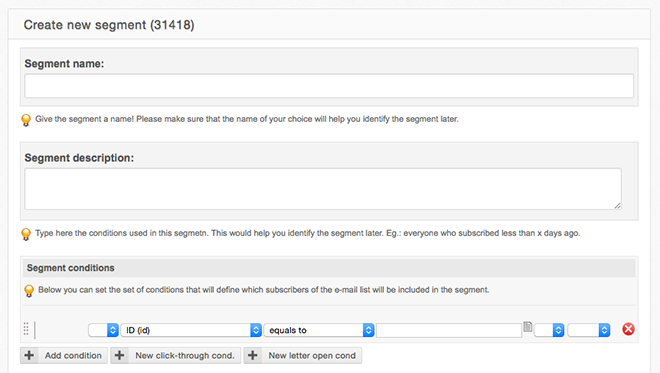 By default the segment filters out recurring e-mail addresses and lists the first occurrence only. Click the "Save changes" button to save the segment. The list of segments will appear. The list shows the number of subscribers in the segment, and there are the options to list subscribers who are in the segment, and you can edit, copy or delete the segment. You can use the created segments to filter subscribers on the listing screen. Or, when you setup a delivery schedule for an email (or SMS or DM print). The email will be sent to the subscribers in the selected segment(s). For more details see send email at a given time tutorial.